Ready for the Bavarian Open! On Thursday the Bavarian Open begins and I am at the start so fingers crossed for nice weather! Hope to see you there! Read more about Ready for the Bavarian Open! Pre-flight checking my Blackhawk paramotor before the demo flight on Saturday. The main event day is today and the wind seems to be perfect so far for dynamic low level maneuering! Smoke on at 16:23 at the RedBull Air Race! Smoke on! Paramotor demoing at the RedBull Air Race in Rovinj, Croatia today at 1 pm and tomorrow at 4:20pm! If you are around come to watch or say hi at Vrsar race airport! Testing the new Ozone Trickster2 and filming together with Félix Rodriguez! Read more about Greetings from Chamonix! What a beauty! An ENZO2 'S' prototype just arrived yesterday and today took it for a nice 3 hours cross country flight near home! This wing is incredible! Conditions were really unique since the mountains are covered with 1.4m of fresh powder! Almost everything is under snow but light thermals were on and managed to make my very first out-and-return XC flight from here! After all however, the time has come for a change! 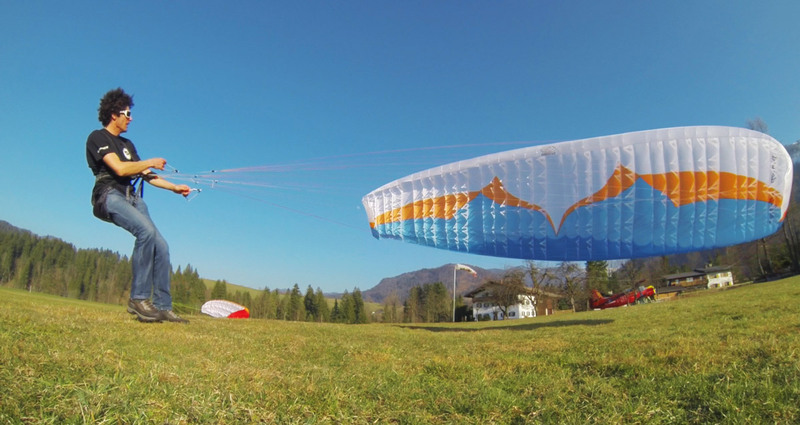 Now, a completely new era of my paraglider life is about to begin! I am extremely excited and proud to announce that from now on I will exclusively fly Ozone - probably nowadays leading and most innovative brand on the market! I am really looking forward to this journey that will definitely open new horizons to realize future dreams! Many thanks to the entire Ozone management and team for the warm welcoming and for having me on-board! So let's go flying now! Read more about Fly OZONE! On Monday I had the chance to co-pilot a Robin Remo aircraft cruising across the Werdenfelser region including circumnavigating the Zugspitze. 5 minutes after landing, took off again with a sailplane, but unfortunately the weather was really stable so we couldn't stay up long. The Stubai Cup paragliding testival last weekend witnessed incredible weather and hundreds of pilots enjoying great flying conditions! I performed 3 acro shows per day of which some in tandem, giving my passengers a good adrenaline rush! Thanks to the Parafly crew for the nice organization for the 23rd time! I am happy to introduce you my new web-shop! It is a great feeling to know that my products will be there with you in many exciting and happy moments!